Journal Reference: Yang F, E Luke, P Kollias, A Kostinski, and A Vogelmann. 2018. 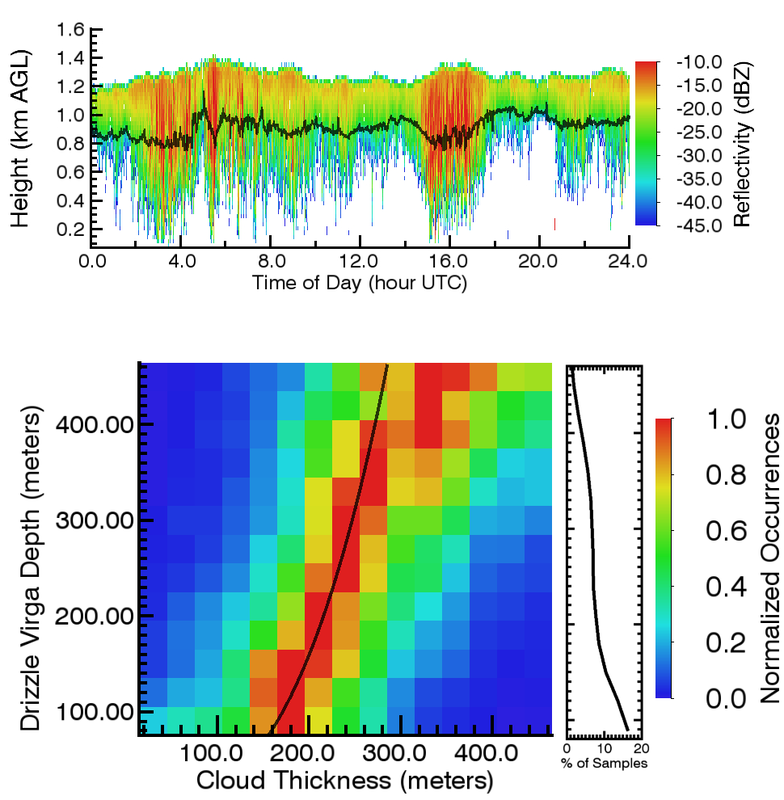 "Scaling of Drizzle Virga Depth With Cloud Thickness for Marine Stratocumulus Clouds." Geophysical Research Letters, 45(8), 10.1029/2018GL077145. 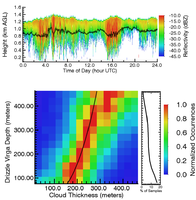 (Top) Time series of radar reflectivity of a marine stratocumulus cloud at the ARM Azores site on March 4, 2016. The black line is the cloud base and the radar reflectivity below this line indicates virga. (Bot) Drizzle virga thickness versus cloud thickness. The color represents the horizontally normalized occurrences, and the black line is the best third-order power-law fit, showing good agreement between the theory and observations. Virga is drizzle below cloud base that evaporates before reaching the Earth’s surface. Virga results from the interaction of many different cloud processes with the environment. Researchers at Brookhaven National Laboratory and Michigan Technological University obtained virga statistics from observations and derived a new, simple analytical expression for drizzle virga depth. The expression is a function of cloud thickness and is shown to agree well with the independent observations. Stratocumulus clouds cover large areas in subtropical and tropical ocean regions and are frequently drizzling. Knowledge of the depth of the drizzle virga helps us understand where below-cloud evaporative cooling and moisturizing occurs that affect cloud evolution, and where scavenging of atmospheric particulates occurs. Our formula provides a simple representation for drizzle virga of stratocumulus clouds suitable for use in other models, which may lead to improved numerical representations of marine stratocumulus clouds and also benefit rainfall predictions in weather forecast and climate models. Unique, long-term, ground-based cloud radar observations are used from the Atmospheric Radiation Measurement (ARM) facility Azores site to examine the properties of drizzle frequency and virga depth. Drizzle statistics were obtained by analyzing a 14-month period that resulted in selecting 42 days of single-layer marine stratocumulus clouds containing more than 1.2 million cloud profiles. Observations show that 83% of marine stratocumulus clouds are drizzling although only 31% generate surface precipitation. A minimalist model was built independently of the observations that links drizzle virga depth with cloud thickness. The model predicts that drizzle virga depth has a cubic power-law dependence on cloud thickness and, interestingly, does not formally depend on cloud droplet number concentration. The analytical expression agrees well with the independent, remotely sensed marine stratocumulus drizzle virga statistics and provides a simple parameterization for virga depth suitable for use in other models.